This is Part 1 of a 2-part series about memorization strategies. When you’re done here, check out Part 2 for more memorization tricks! The reason we forget information so quickly is that our short-term memories can’t hold too much for too long. We only remember information that has been moved into our long-term memories, which takes time, repetition, and frequency. In other words, it takes EFFORT to remember stuff for good. Even if we manage to move information into our long-term memories, we can still find ourselves forgetting it some time later. This is typically because we have stored it in a way that makes it difficult or impossible to recall when we need it. It’s like filing something under the wrong name in the wrong folder: how the heck would we find that file later if we don’t know where we put it or what we called it? If you’re trying to memorize new information but you don’t understand that information 100 percent, then you’re not going to be able to store the material in your brain. Period. If you’re unclear about what you’re learning – a new vocabulary word or a new concept – your brain won’t know what to store (memorize) or how to label it for when you need to recall it later. So before you try to memorize anything, make sure you understand it completely. Here are 3 study tips if you get stuck. Our brains like to categorize bits of information together into groups. We often do this without even thinking about it … it’s just natural. Learning “chunks” of material at a time is a great way to memorize information because the other items in that category will serve as “triggers” to help you recall that material later, like for a test. For example, if you’re studying 20 new vocabulary words, group similar words together and study each group of words separately. You could even group all the positive words together, the negative words together, and the neutral words together; then study these three groups one at a time. If you forget one of the words, you’ll likely at least remember what group it’s in – and sometimes that’s enough of a trigger to get you to recall the original word. Studies have proven over and over again that the way we learn new information is by connecting the new stuff to something we already know. Think about it: when we try a new food for the first time, we often immediately connect it to flavors we’re familiar with, thinking thoughts like that tastes like chicken or that tastes like maple syrup. So when you’re memorizing new information, do everything you can to make connections to things you already know — and then your brain will be better able to make sense of it and store it properly in your long-term memory. For example, if you’re studying The Stamp Act in history class (when the British taxed the colonists on a variety of paper publications such as legal documents and newspapers) you could connect this to what you know about today’s US postal stamps. Duh, I know today’s stamps really have nothing to do with The Stamp Act, but you spend money on stamps to mail printed materials, right? So isn’t that kind of like paying a tax on printed publications? See how making that weird connection would help you remember what The Stamp Act is? Moving new information from your short-term memory (or working memory) into your long-term memory takes time, effort, and strategy. You might get frustrated and think, What the heck – some people just learn things faster than me! While some people do seem to memorize information faster than others, it’s really because they are using these study strategies. The quick-learners are actually learning more quickly because they are thinking about what they are learning and making conscious efforts to get that information to stick around. 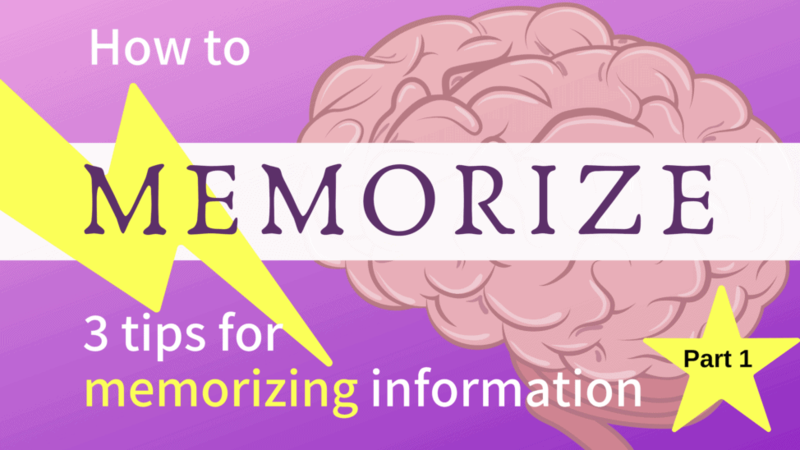 Up next: Go to Part-2 of this series, where I give you 3 more awesome tips for how to memorize information.